If you look at the heading of my blog, you will see that one of my mottos is “I will try anything twice”. Anna Maria Oyster bar proves that point. Gabriel and I had a pretty poor experience the first time we went. As regular blood donors, we were given a $25 gift certificate to A.M.O.B and went to check it out for the first time about 2 months ago. We arrived to find a totally dated and tacky atmosphere, and a crowd of patrons whose average age was probably around 75. We sat in a booth with plastic-y, pastel cushions in the back, and noted the weird painted mural on the walls, the horrible lighting and the feeling that we were in 1967. We ordered a small salad (mixed greens with tomatoes, toasted almonds, strawberries, blue cheese and raspberry vinaigrette), a bowl of lobster bisque, and a cheeseburger with fries, a pickle and coleslaw. 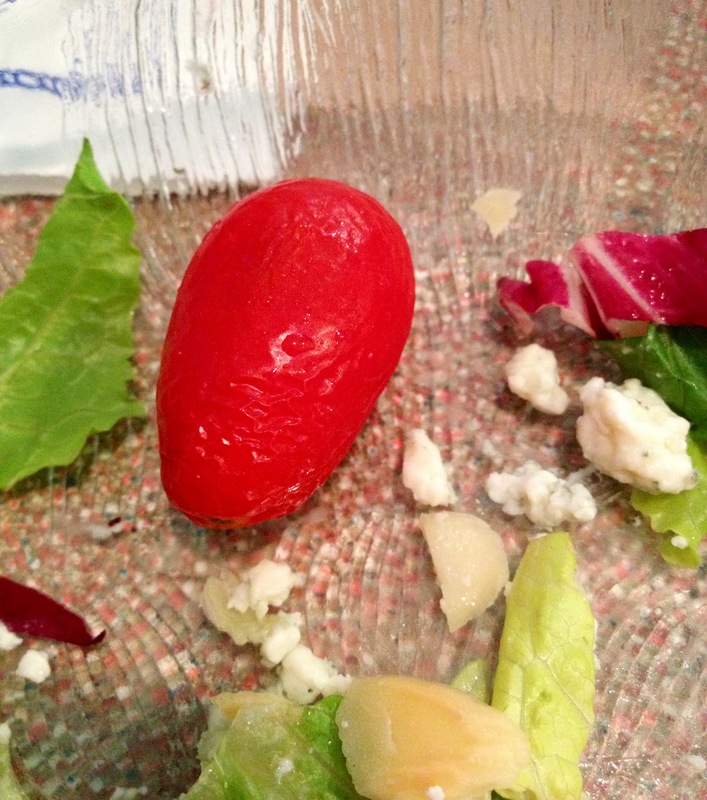 Our salad consisted of slimy strawberries, tomatoes that were wrinkled and shriveling on their way to rotten, lettuce that was browning and the most overly-sweet, jelly-like raspberry dressing I’ve ever had. Gross. We immediately alerted the waiter to our total disappointment about the salad, asked for a new one with different dressing, and moved on to the soup. The bisque is raved about on the website and described as award winning on their menu. It was not good. It was so salty, I really couldn’t eat it. It was mostly cream and salt and just enough lobster (or maybe lobster juice) to make it pink. Really not good. Definitely not about to win any awards in my book. The burger was fine. I know it’s weird to order a burger in seafood place, but having just donated blood we needed an iron fix. It was ok, not bad, not great. The fries were pretty darn good, as is just about anything when it’s deep-fried to a crispy golden color. The floppy pickle and over-mayo’d coleslaw wasn’t really worth finishing. The meal was really just a total let-down and we let the waiter know. Maybe the tables packed with elderly folk have tastebuds that don’t really discriminate food like this, but we don’t pretend it’s good when it’s not. The manager came over shortly after and said the whole meal was on him. He told us to please keep our $25 gift certificate and come back another time. Well, ok. It definitely wasn’t something I would have done otherwise, but a free meal and deep apology warrants chance #2. So, a couple of months later, the opportunity to go back presented itself when we were in that neighborhood again. We took a deep breath, parked in the lot with as open a mind as possible, and asked for a table outside. We were led to the side of the building and a choice table facing the lake. It was a gorgeous day, with a lovely view and already this experience was way better than the first. 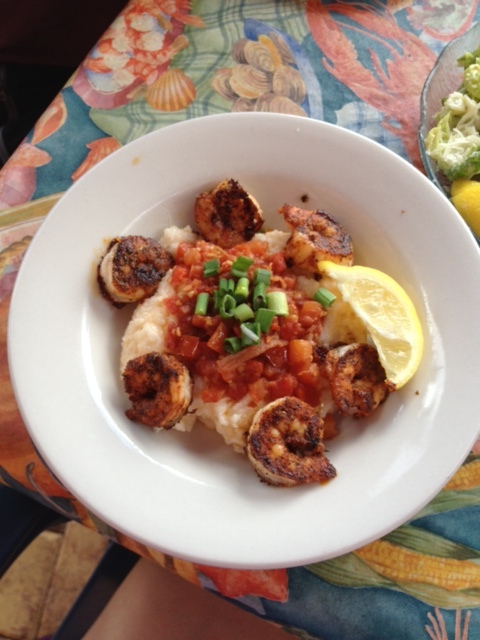 A very friendly waitress named Delilah told us the specials, and her description of the grilled shrimp with cheesy grits sounded too good to pass up. 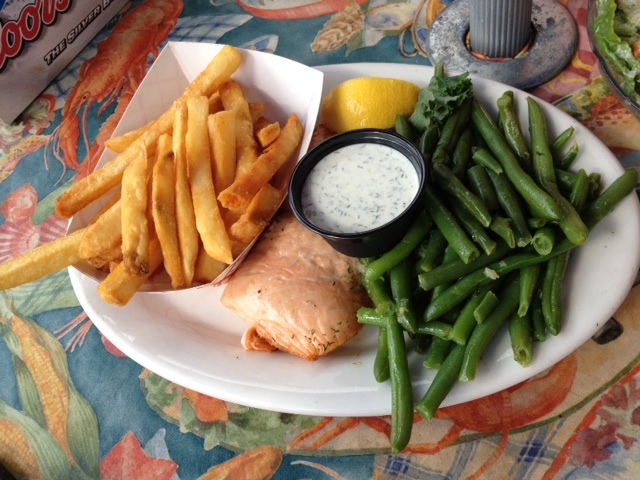 We ordered that to start with, plus a Caesar salad, and salmon with dill sauce, french fries and green beans. The app came out fast and looked amazing. The grits were ok but the shrimp were incredibly salted. Gabriel agreed, but ate them anyway, but I really couldn’t manage them. I worried that this meal was going to be worse than the first. The salad and the salmon, thankfully, were actually very good. The dressing was homemade and just fishy enough, the salmon was fresh, cooked well and it’s dill sauce was creamy and delicious. The green beans were fresh and not overcooked- there is nothing worse than mushy green beans, and the fries- like last time, were great. The view definitely made everything taste a little better, and the avoidance of the inside of the restaurant helped to change the feel of our experience to a more positive one. Overall, I am glad we gave it a second try. It was still not outstanding, but had our first experience been like the second one, we might have gone back by choice and not because we got our meal comped and had a gift certificate to use. I’m still not sure I’ll ever return…but in all fairness, I probably should go back one more time to have the oysters. After all, it’s what they do and what they are named for…and I DO love oysters. Maybe the third time will be the charm. What do you think?